A smudge stick prepared to purify a new apartment before moving in. A smudge stick is a bundle of dried herbs, most commonly white sage. 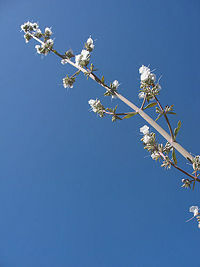 Often other herbs or plants are used or added and the leaves are usually bound with string in a small bundle and dried. Some other herbs and spices that are often used include cilantro, cedar, lavender, and mugwort, none of which are native to the Americas. Smudge sticks are used in a practice known as smudging, in which the dried herbs are burned to produce a cleansing, positive-energy smoke cloud. Smudging is both a ceremonial and an every day practice, akin to washing one's hands before dinner. While smudging is not exclusive to Native Americans, and it has been practiced all over the world, its modern incarnation as propagated by various New Age movements owes a great deal to Native American history and rituals. In addition to having spiritual benefits, there is a great deal of scientific evidence proving smudge sticks' effects as a pesticide, a meat preserver, and in increasing the flow of oxygen to the brain, making it a modern melding of the spiritual and the scientific. 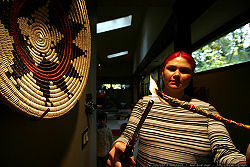 A woman lights a smudge stick made of lavender. A smudge stick is a bundle of dried herbs (sage among the most common) that is tied together and burned for the purposes of purification. Smudge sticks are used in ceremonies and rituals involving smudging, a practice that involves the burning of certain herbs to create a cleansing smoke bath, which is then used to purify anything from people to ritual and ceremonial space, to tools and objects. This practice is ancient, and held as sacred by many cultures, including the Native American culture. There are many different ceremonies and rituals that include smudging. Each culture has its own way of bringing about physical, spiritual, and emotional balance, of cleansing negative energy and differing cultures and people have their own methods and herbal mixtures for smudging performed for varied specific purposes. Native Americans, for example, tended to favor sage that was lit from the central or cooking fire. The smudge stick is the actual herb or bundle of herbs that is burned. Made popular by the New Age movement, smudge sticks find continued and wide use in contemporary, middle-class Western nations. 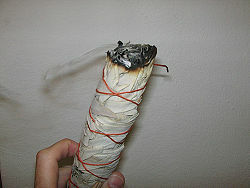 A wand of white sage, often dried and bundled together to make smudge sticks. Herbs are used as smudge sticks during smudging ceremonies. Though which herbs, exactly, are used can vary infinitely, there are some common ones, along with some common meanings. The principal herbs used are sage, cedar or juniper, lavender, and sweet grass. In addition, pure tobacco is used by some Plains Indian tribes. The smudge sticks are burned in a pure form, composed of only one herb, or as a mixture, depending on the desired effect and on tradition. The Sage (Artemisia tridentia) used in smudge sticks, indigenous to the Americas, is not the same as the European varieties, and is the most common herb burned as a smudge stick. Smudge sticks of Sage are burned in smudging ceremonies to drive out evil spirits, negative thoughts and feelings, and to keep negative entities away from areas in which ceremonies take place. Sage is also used in keeping sacred objects like pipes or Peyote wands safe from negative influence. In the Sioux nation, the Sacred Pipe is kept in a bundle with sage boughs. Crystals can be so protected this way as well. Unburned sage was also used in keeping sacred objects like pipes or Peyote wands safe from negative influence, and its effects as a smudge stick can be drawn from this practice. Cedar, often referred to as Juniper, smudge sticks are burned while praying to the Great Spirit (also known as Unsen, the Source, or Wakan Tanka) in meditation. It is also used to bless a home before taking residence there, a tradition dating back to the Northwest and Western Canadian Native Americans. It works both as a purifier and as a way to attract good energy. Cedar is primarily considered a fire element, though it is often used for general, four-element purposes. It is known for its sharp, piney scent and is believed to aid clairvoyance, revive the tired mind, body, and spirit, and stimulate contact with other worlds. A mother performs a smudging ritual to cleanse her newborn baby. The term "smudge stick" entered the English language through Indigenous American Indian traditions in America, beginning with post-Columbian colonization and propagated much later in the New Age traditions of shamanism. The binding of smudge sticks for many traditions was a sacred, intentional process in and of itself. The process of employing scent in rites of purification, be it in censers, through burning incense or smudging (the process of using a smudge stick) is endemic throughout traditional rites in many cultures, as explored by ethnography, anthropology, and sociology. Smudging has been used for thousands of years, though it is impossible to say exactly when smudging began, and its history is certainly not limited to Native Americans. In some cases, smudging is linked to the use of incense, as incense, like a smudge stick, is a natural object that is burned for a specific purpose. The history of incense itself goes back thousands of years to Egypt in 1530 B.C.E. Israel, in the fifth century B.C.E., devoted separate altars for the offering of incense. Indeed, herbal smoke mixtures or incense are burned around the world, from China and Southeast Asia, to India, to Europe and the rest of the Western World. The Native American history with smudge sticks may have begun because of very practical reasons, however. Smokes from certain herbs have been scientifically proven as excellent pesticides. Other smokes are known to preserve food and hides. Thus, associating the burning herbs with positive energy and cleansing attributes is not a far leap. When there were no sticks to speak of, sacred herbs and resins were simply burned in a special bowl. The smoke produced was wafted around the person, place, or object needing purification and cleansing. Smudge sticks offered an innovation that made such rituals and ceremonies easier to perform and with greater control. Rather than wafting the cleansing smoke towards the subject, the bearer of the smudge stick was able to form a smoke blanket applying the power of the herb to the precise area desired. The herbs most often used were sage and sweetgrass. The sage drove out the negative and the sweetgrass attracted the positive. 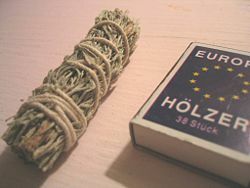 A home-made smudge stick, with herbs wrapped up in paper. Smudging is the common name given to the Sacred Smoke Bowl Blessing. This is a powerful cleansing technique of Native American origin. To many traditions, smudging involves a four directions ceremony or prayer. It, thus, sends specific kinds of smoke or prayer into the four different directions. Of course, different tribes have different prayers, but the smoke is typically directed to a specific action or a specific direction, aiding in divination. However, in general smudging is used to maintain balance and shield against negative energy. As has been noted above, it is often used as a cleansing agent. Some smudging rituals are performed on a daily basis. Others are reserved for special or ceremonial occasions. In general, smudging has been likened to the washing of hands before a meal. Those that practice smudging often have a smudge kit, consisting of four of five elements, each representing one of the four or five elements (earth, fire, water, air, and sometimes spirit or life energy). A shell represents water, for example, and unlit herbs represent earth. The lit herb represents fire, and the smoke represents air. There is no limit on what places or objects may be the object of smudging, and people often perform smudging on themselves. In addition, various movements have various meanings. One particular method involves blowing on the embers after the smudge stick has been lit, adding the energy of breath to the fire. Moving the stick over the left side of the body represents the female aspect of life, while the right side represents the male aspect. Moving the stick clockwise represents the circle of life. Moving the stick counter-clockwise represents undoing or unwinding, especially in reference to tension. Smudging is by no means an outdated, archaic practice. It is often used by real estate agents to cleanse apartments, condos, and houses before they are sold. Indeed, modern science has proven that the aroma of sage increases the oxygen supply to the brain, producing a physical relaxation of music tension. In addition, the smoke from some herbs actually changes the molecular structure of air and energy, producing a cleansing effect. As the sense of smell is connected very powerfully to instinct and memory, the burning of smudge sticks has been found to be a very effective aromatherapy agent, especially when combating feelings of depression, anger, fear, frustration, resentment, and grief. ↑ 1.0 1.1 1.2 Crystal Links, Smudging. Retrieved August 16, 2008. ↑ 2.0 2.1 Stephanie Yeh, What is Shamanic Smudging?, About.com. Retrieved August 16, 2008. ↑ Spiritual Scents, What Is Smudging? Retrieved August 16, 2008. ↑ 4.0 4.1 4.2 Jennifer Kays, Smudging and Smudge Sticks for Health and Aromatherapy Benefit, SelfGrowth.com. Retrieved August 16, 2008. Alexander, Jane. The Smudge Book: Inspirational Rituals to Cleanse and Heal. London: Thorsons, 1999. ISBN 9780722538111. Budilovsky, Joan, and Eve Adamson. The Complete Idiot's Guide to Meditation. Indianapolis: Alpha Books, 2002. Charlish, Anne. Cleansing for Body & Spirit. London: Haldane Mason, 2000. ISBN 9781902463179. Kays, Jennifer. Smudging and Smudge Sticks for Health and Aromatherapy Benefit. Retrieved August 16, 2008. About Smudging and Smudge Sticks. How to do a Sage Smudge Ceremony. This page was last modified on 20 July 2015, at 23:05.